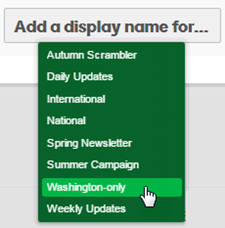 By adding a display name, a subscriber will have the option to remain subscribed to a specific list when they attempt to unsubscribe in a campaign. At the top of the page, click Addons, and then select Add more. Scroll to the Display Names Add-on and turn it on. Click the gear button . Click Add a display name for..., and select a list from the drop-down menu. 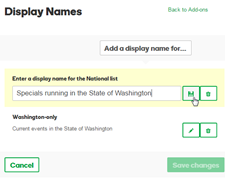 Your display names can be different than your internal list names. Enter the display name you want your contact to see, and click Save. Note: The label doesn't need to match your actual list name. Specify a public name that makes sense to your subscribers. Now, whenever anyone clicks Unsubscribe from your mailings, they will see a list of subscriber lists they can remain subscribed to.